diary of a crazy person: Cookies!! 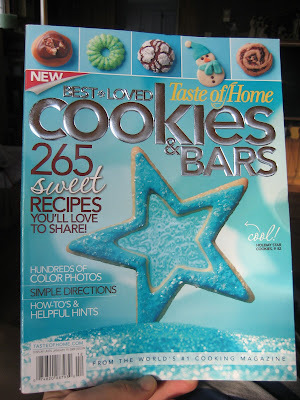 I bought this magazine a few months ago, and wanted to make the cookie on the cover, but never got around to it. Now I have decided to make every single recipie in this book. From back to front. All 265 of them. Even if I think it is gross. Then I will share with people and see that they think of them. Then I will share it with you!! I will let you know what people thought of them and how easy or hard they were to make! I would like to do this with a few different cookbooks. Then I would like to compile all the recipies that I love and make my own cookbook. And I will sell it and the proceeds will go to my shelter. Obviously a long term plan. Can't wait to start baking! That's a great idea!! You are ambitious!! Looking forward to hearing about the incredible ones!